Rescue Flash Signal Mirror, 2 x 3 inches (5 x 7.6 cm) Lexan polycarbonate with mil-spec style retro-reflective aiming aid for one-handed use, instructions on back, protective cover to prevent scratches while stored in the kit, lanyard hole. Pocketsize Clear Vinyl Pouch - 4 x 5 inches (10.2 x 12.7 cm), 4 x 3.25 inches (10.2 x 8.3 cm) with top folded over, waterproof zip-top closure, lanyard hole, it really does fit in your pocket. eGear PICO Lite LED Flashlight – designed by Doug Ritter, secure twist switch with lockout tab, use for nighttime activities and signaling, use mini-carabineer clip to prevent loss. Up to 15 hours run time. Batteries are replaceable. Katadyn® Micropur MP1 Water Purification Tablets – Six tablets individually sealed. 1 tab treats 1 qt/1 liter of water. 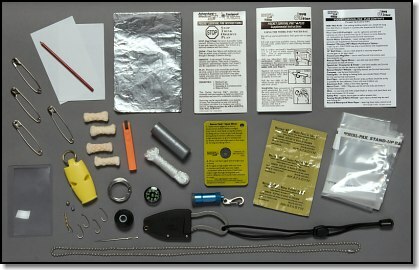 of each of the components in the kit. 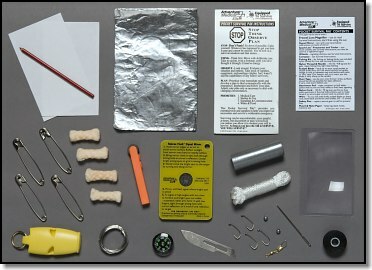 Adventure Medical kits reserves the right to add, replace or withdraw items at its discretion. If you are not 100% satisfied, Adventure Medical Kits will gladly exchange the items. Assembled in the USA of U.S. and imported components.